Three weeks after five people were killed in an Akko apartment building, police are ready to "definitively" blame criminals. Last month's gas explosion at an Akko apartment building that killed five people – including an eight year old – was deliberately caused by criminals, police announced Thursday. Police announced that they had “definitive evidence” that the explosion was caused by criminal elements. The investigation, opened immediately after the explosion at the 3-story Akko apartment building on February 17, has yielded four arrests already. All four are Akko residents and have “rich” criminal histories, police said. Police actually arrested two of the suspects immediately, as they were the only two of the eleven people injured in the blast who did not live in or near the building; the fact that they were in the area just when the blast went off, said police, gave them adequate cause to suspect the two, who further implicated themselves, and led them to two other suspects. The explosion was caused by a leaking gas canister, which police say was apparently set afire on purpose by the suspects. The explosion killed five people: 43-year-old Muhammed Bader and his wife Hanan (39); Ra'eek Sarhan (40) and wife Najah (35), along with their eight-year-old son Hamed. 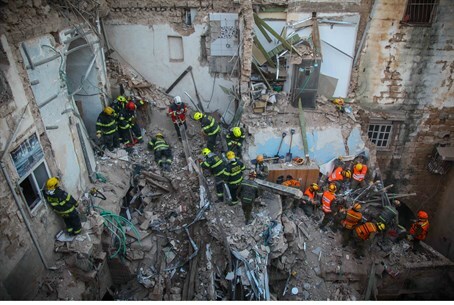 Several of the injured and dead were trapped for several hours under debris from the explosion, which caused part of the building to collapse. The investigation is continuing, with police trying to establish a motive. Further arrests are expected.